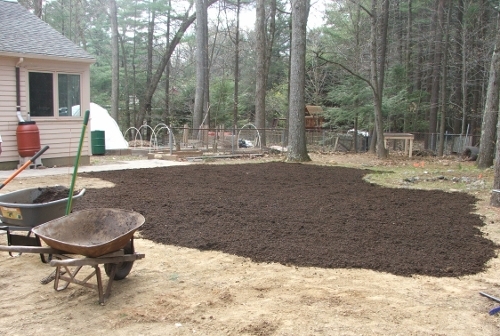 DH and I worked on the backyard the entire day: grading it with sifted soil, evening it out, then adding 1 to 2 inches of our composted cow manure. We still have about 1/3 to do, and I’ll try to finish that by my lonesome tomorrow, because DH needs to go into work. Then we sow the grass seed and keep our fingers crossed. 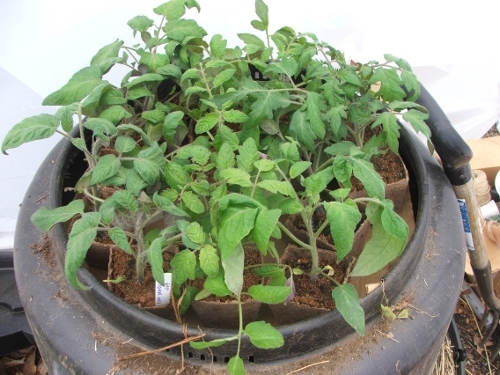 The tomato seedlings are getting too big for my setup in the basement. 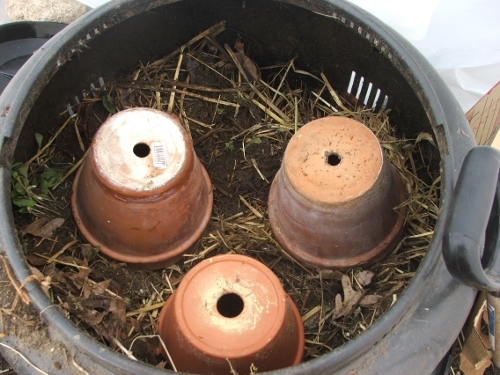 They still fit under the lamps, but (1) they’re shading each other out and (2) they’re holding up my next big seeding. 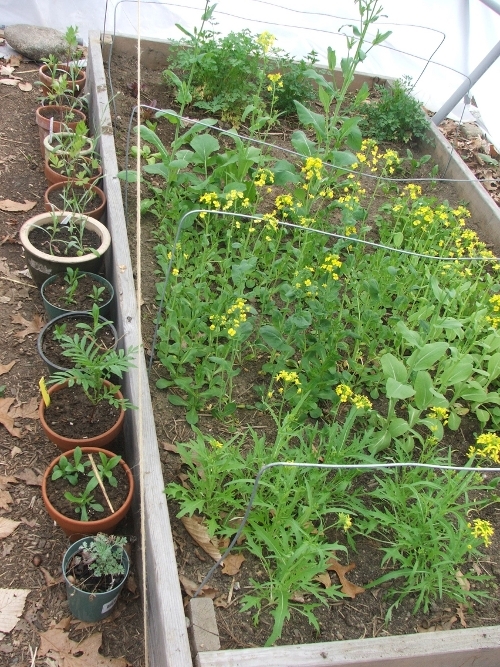 Honestly, these (Mache, Claytonia and Minutina) would have bolted with or without hoop house, and I’m letting them because I want to save the seed.� The spinach, kale, and lettuces are all loving it in there. But anyway, what’s the holdup? 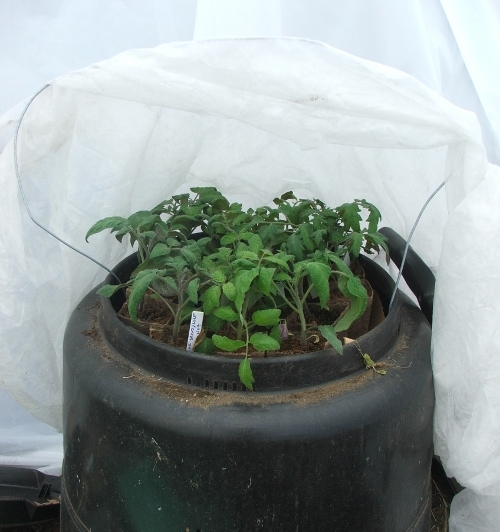 This compost bin (inside the hoop house) is going full steam, and I’m hoping it and a row cover will keep my seedlings warm overnight.� We’ll see. It’s quite nerve-wrecking! Last but not least we had a well-deserved dinner of rib eye steak on the grill: its first firing of the year. We eat meat about 4 times a month, and then it’s always a feast. 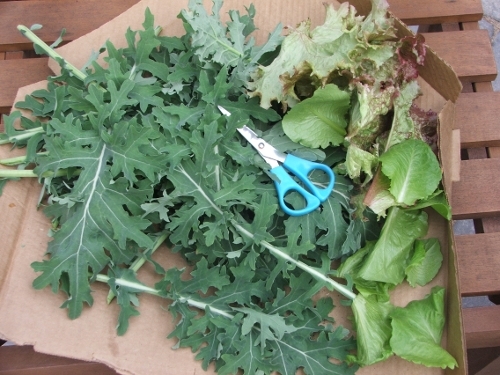 With that we had homegrown kale and a homegrown salad, all from the hoop house. That thing may be in the wrong place, but it’s still doing what it was made to do: extending our season.